High abrasion and mar resistance to splash, spillage and immersion in a wide range of chemicals. 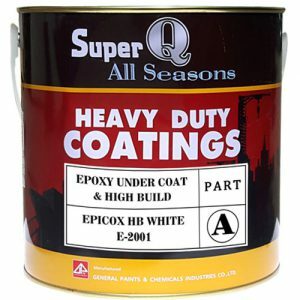 Provides an excellent base for high quality finishes. Excellent chemical and weathering resistance. As an undercoat or finish coat for protection of steel, concrete in aggressive condition. It is suitable for portable water tank lining, steel structures, industrial works, pipeline. Store in a tightly sealed container in a cool and dry space. It contains volatile and flammable solvents, ensure adequate ventilation during use and avoid using near fire. Values given as average for reference. All equipment should be cleaned immediately with white spirit after use.